Have you heard about Sirih Beach? It is a beautiful coast located in Karang Bolong Street, Serang Regency. Still, it belongs to Banten Province. The beach is recognized due to its beautiful white sand. The location is quite strategic, so everyone can reach it easily. It is also situated near to several hotels. There is a ticket fee, but it is not expensive. On top of that, the beach is quite crowded. That means you may expect many visitors, especially during the holidays. Somehow, it gives you the chance to make new friends. Also, the beach may increase your family bond. Many people love the soft texture and the beauty of the sand. No wonder, the locals consider Sirih Beach as their signature tourist spot. The water isn’t quite clear, but it features calm waves. Near to the seashore, there are several “warungs” or food stands. Tourists are able to enjoy good foods there. Not to mention local beverages are also worth a try. Some of them are called “wedangs”. These include local tea, coffee, ginger, etc. If you love iced drinks, you can simply talk to the sellers. 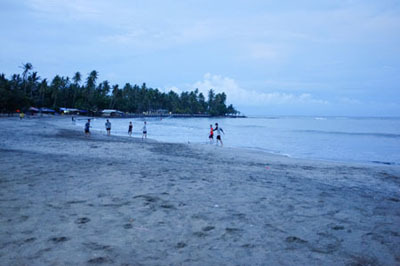 In terms of facilities, Sirih Beach provides almost everything. These include banana boats, jet skis, local boats, tents, and much more. For those who want to swim in the water, you can simply rent a floating tire. It is a crucial item for your kids. This way, the children can swim safely. For families, a lunch on the beach sounds great. The thing is you need to carry a mat and some foods. As an alternative, you can buy some foodstuffs and drinks from the food stands. Sirih Beach features a hot temperature, so it can be uncomfortable at noon. In this case, you need to carry several items such as a hat, sunglasses, sunscreen, etc. At least, these things help you reduce the sore sensation due to excessive heat. There are no shady trees, so you should not expect refreshing nuance there. Sometimes, the water appears grimy. Despite these weaknesses, you won’t regret visiting Sirih Beach. It is a recommended place to enjoy a family vacation, after all. The next thing to do in Sirih Beach is relaxation. Tourists can simply enjoy the nuance. It is because the beach features many visitors, stunning sand, food vendors, and outstanding facilities. As for relaxation, you can use a mat and sit on the sand. Make sure to come with friends or families, though. If you come with your spouse, the beach also emits a romantic nuance, especially during sunset. Isn’t that great? First, you need to head to Serang Regency. It doesn’t take much time from Jakarta, actually. With a regular car, the trip takes 1-2 hours and the distance is approximately 86 km. The best routes to reach the location are Pantura Street and Tangerang-Merak Freeway. Once you reach Serang, it is time to head to Karang Bolong Street.